Goals are the embodiment of your future dream. I’d venture to guess that your dreams include a thriving local and online real estate presence and the ability to make an impact. At the end of the day, you want it to be about more than business, though. You want people to buy, sure. But you want them to like what they buy, come back for more, and recommend you to anybody and everybody. 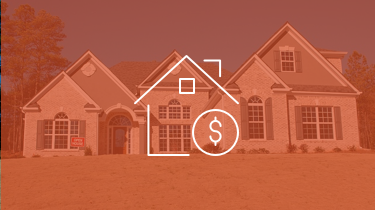 Unfortunately, when it comes to real estate content marketing … goals get murky. Content marketing is one of those things you know you should be doing. It improves search rankings, drives organic traffic, positions you as a leader and a trusted expert, and — of course — generates leads and sales. The question today is: How do you set achievable, measurable, and actionable goals? 1. Where Is Your Real Estate Marketing Now? Audits aren’t exactly fun. But they are necessary. In fact, no matter what you call it — audit, SWOT analysis, or just a wide-eyed, data-driven checkup — it’s always the first step in getting to your goals. Luckily, in our world of frighteningly fast technological advancements, self-auditing tools are in abundance. 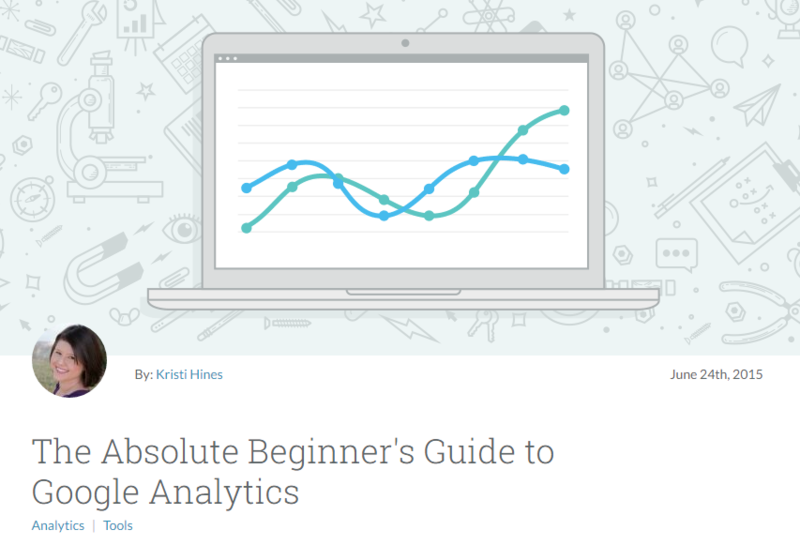 Tools such as Google Analytics and Kissmetrics give you these insights on a silver platter. 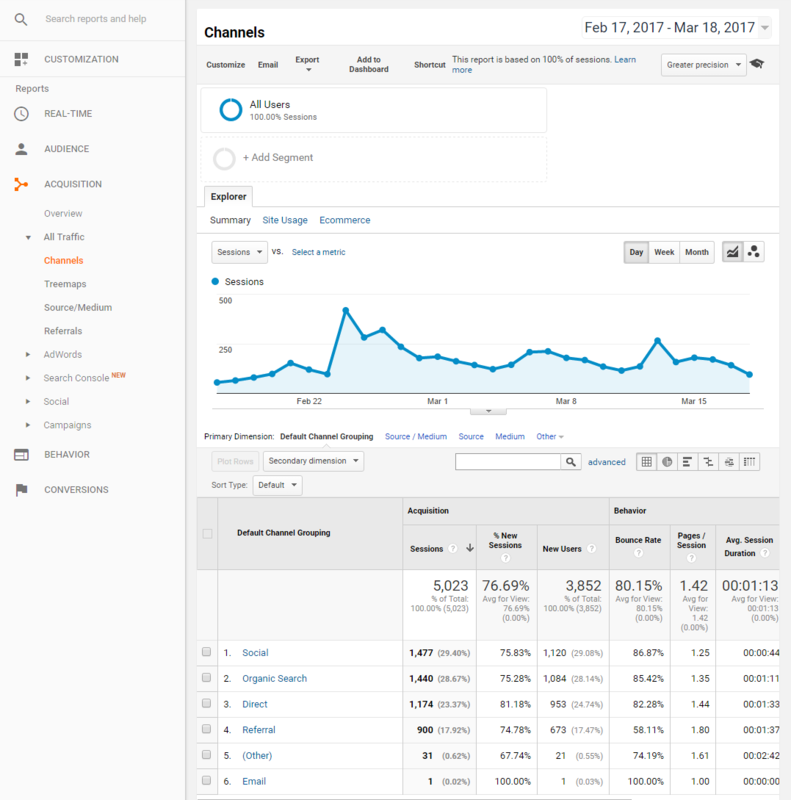 They are relatively easy to use, and Google Analytics has a free version, while Kissmetrics has a free demo but eventually charges. 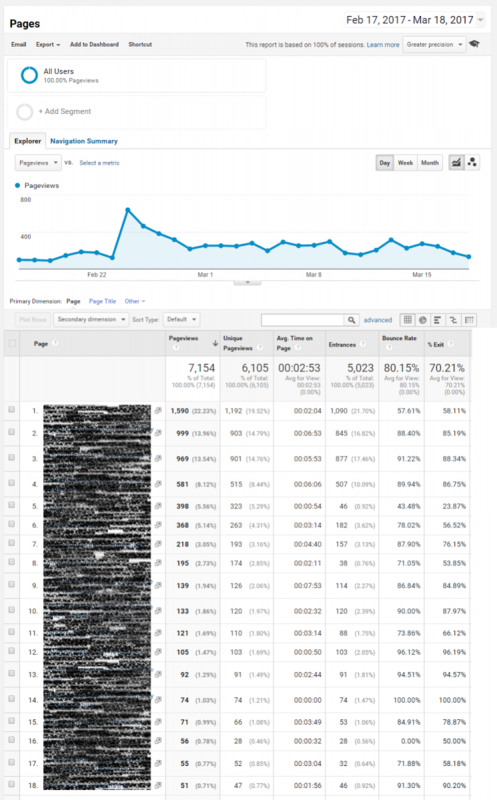 Odds are you already have Google Analytics on your site. If not, the setup instructions are incredibly easy to follow. 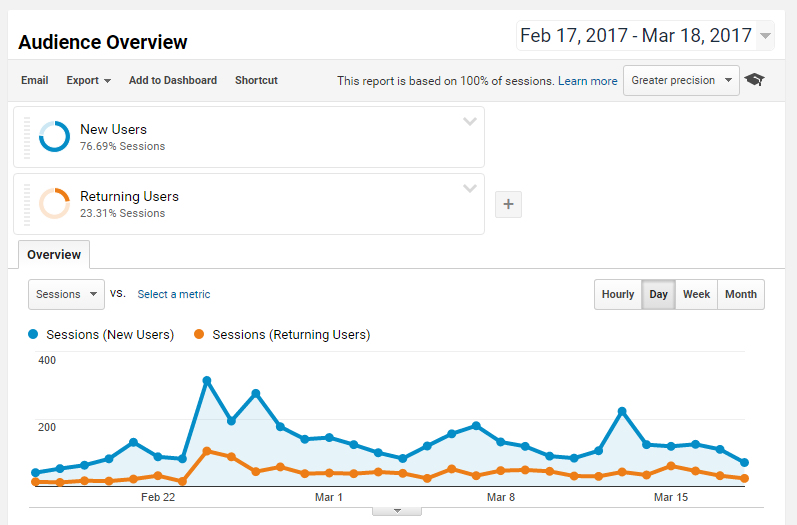 (1) How many unique monthly visitors do I get? 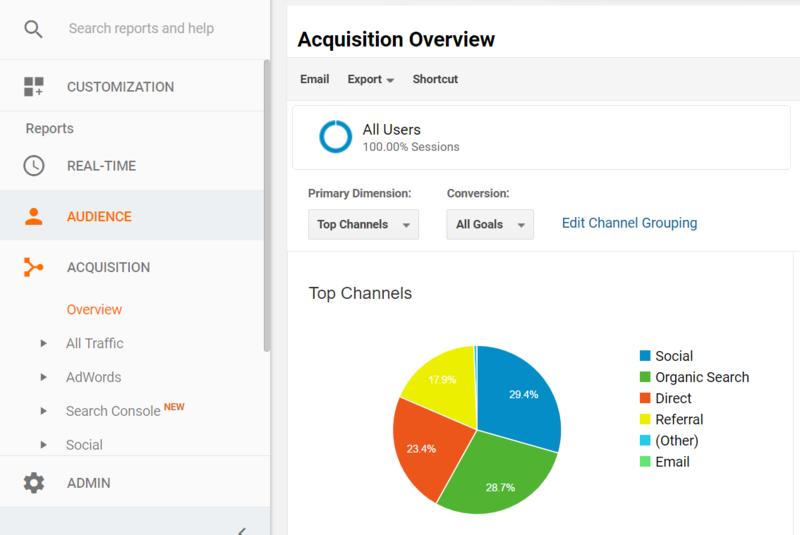 Google Analytics (GA) calls these “New Users,” and it’s the default group you’ll see when you first log in. (2) How many repeat visitors? (3) How engaged are my visitors? 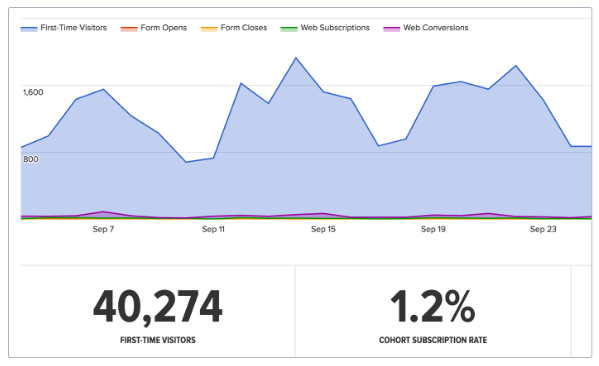 When someone visits your site and leaves without taking an action — i.e., visiting more than one page or filling out a form — GA classifies this as a “Bounce.” Bounces aren’t bad in and of themselves. It could be someone visited one of your articles or infographics, enjoyed it (as indicated by Avg. Session Duration), and then left. Unfortunately — even if someone leaves happy — it’s still a missed opportunity for you to capture their information and develop an ongoing relationship. (4) What are my most popular pages? Discovering what content on your site is already popular is perhaps one of the best clues about the kind of content you should create in the future. This is the kind of content — along with GA Goals, which we’ll talk about next — that has the biggest payoff. (5) How many of my visitors become leads or prospective leads? 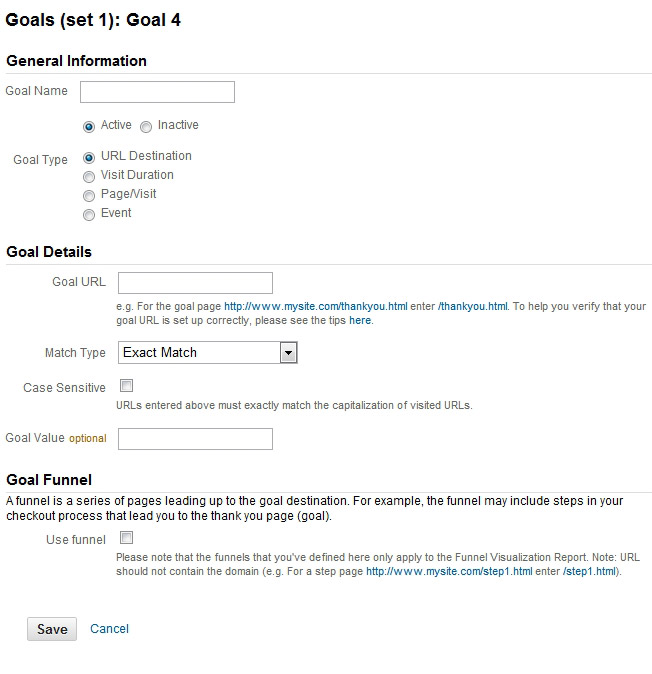 To measure how many of your total online visitors become leads, you’ll need to set up GA Goals. (6) Where are my visitors coming from (search, social, referral, or paid)? Obviously, GA is a robust tool. But starting with these six basic questions will lay a foundation for determining what’s next. After all, if you don’t know how people are behaving on your site, then you have no way of setting or measuring goals. None of that happens by chance. We intentionally optimize all our pages and content to get to the top of search results. The question is: where do you stand? A simple test is to Google some of the words that matter most to home buying and home selling in your area. You might also do the same thing for the questions and answers you’ve already tackled with your content. This should help give you a decent idea of where you stand in regards to SEO. If you can’t find yourself on the first five pages, don’t get discouraged. You don’t have to stay there. In fact, that might make for a fantastic goal later on. In today’s world, knowing how your website performs isn’t enough. You also need to know how your social media platforms are performing. 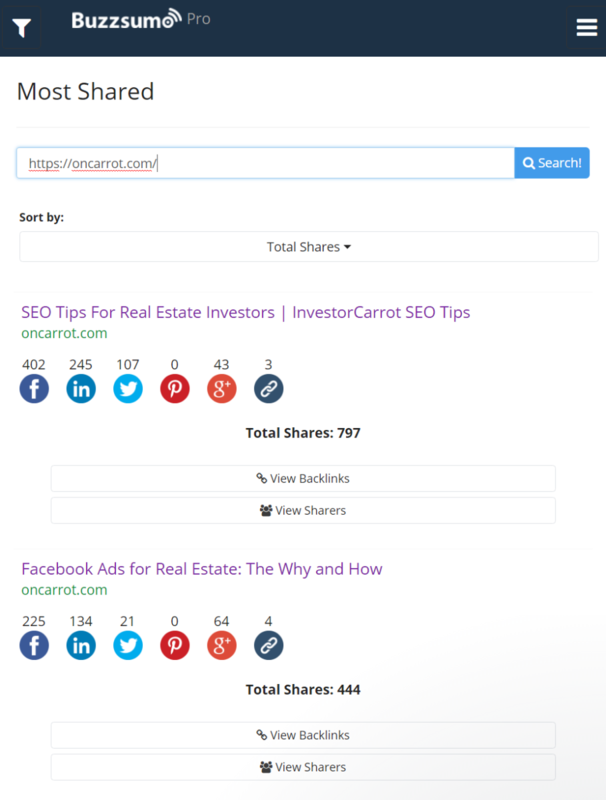 Buzzsumo and SumAll are two great holistic social media analytics tools you can use. That is, they can measure a variety of different Social Media sites. 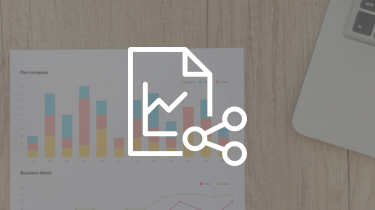 These tools will provide you with information about how individual posts perform, click-through rates, share counts, social media engagement, and — using SumAll — recommendations and insights to guide you forward. Your email list is one of the most powerful tools at your disposal. 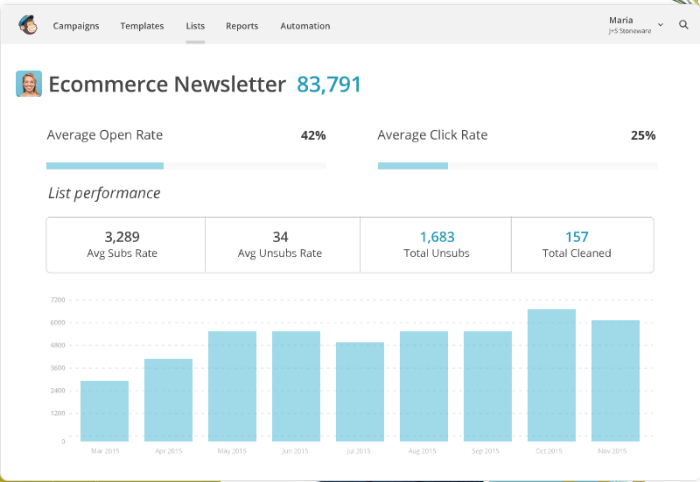 Litmus, Drip, and Mailchimp are just a few of the popular providers that not only help build your email list but offer analytics to measure how effective your emails are. How many of those subscribers are “active”? What are my average open rates? What are my average click-through rates? What are my most successful emails about: topic, subject line, and call to action? And here’s a snapshot of what the three providers mentioned above offer in the way of analytics. Once you start measuring these stats, don’t get discouraged by low percentages. Again, this whole process isn’t about beating yourself up. You need both your own current stats and a standard to measure yourself against. Thankfully, Smart Insights crunched the numbers in 2016. Compare yourself accordingly and don’t get down on yourself if you don’t match up. Remember, you’re learning so that you can improve. Having a system to recognize, follow up, and measure lead quantity is an important tool for goal setting. 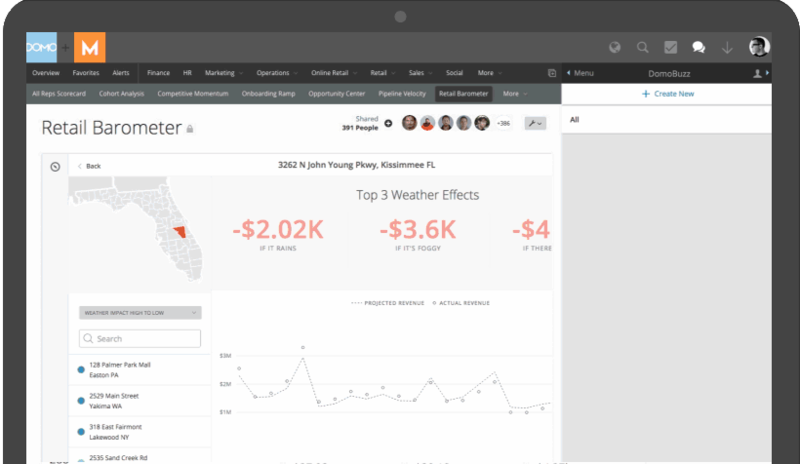 In conjunction with Google Analytics, Leadfeeder is a fantastic tool to help you generate and track leads. But leads don’t just come through online space; they come through more direct routes. Maybe you get a phone call, have a meeting, or hand out a business card. To track offline leads and combine them with your online efforts, you have to be a bit more intentional. Luckily, there’s an app for that. 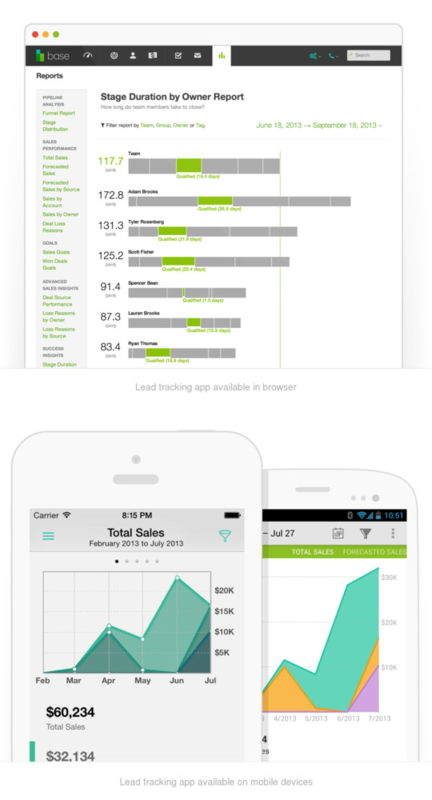 Base tracks your leads and allows you to input leads manually. 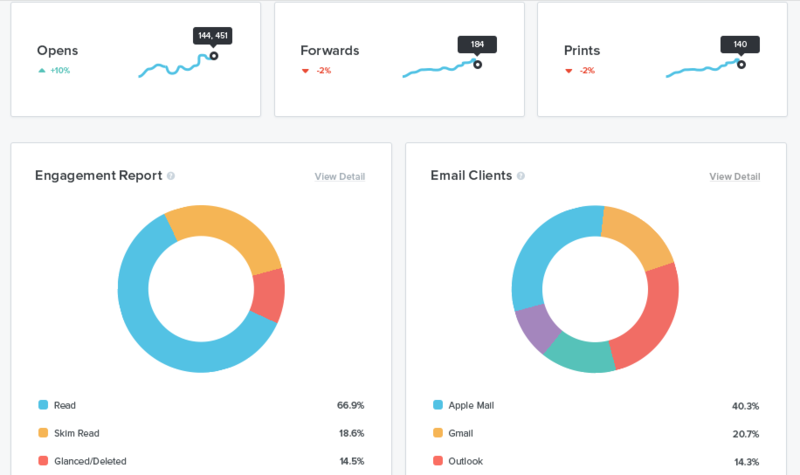 The last thing you need to track is your revenue. Money is probably going to be included in at least one of your goals. And it should be. If you don’t already have a comprehensive tool (or if the one you’re using is cumbersome), here two suggestions. Now that you’re measuring your progress, you know where you stand. Conversely, hopefully, you also have a general idea of where you want to go. To put a finer point on your goals, that’s where we’ll turn next. 2. Where Do You Want Your Content Marketing to Take You? As a rule of thumb, when setting goals, start small. Setting ambitious, business-altering goals from the jump is not worth the frustration that is often the product of such well-intentioned but un-meetable ambitions. Many people, when starting an exercise plan, aim directly at six-pack abs or shoot for — as the headline of this article suggests — The 50 Sexiest Arms in Hollywood and Tips on How to Get Them. Not only is this a recipe for heartbreak and let down, you’ll end up going so hard on your first day at the gym that you won’t be able to pick up groceries (let alone go back for round two). Instead, go slow. It’s okay. Neither life nor real-estate — and especially not content marketing — are sprints. They’re marathons where success starts with knowing where you want to go in the next week, month, year, and only then … beyond. If a goal does not fit within the SMART acronym, it’s best to revamp it. The goals that make progress are realistic and attainable. If you got 30 leads in the last month, try to increase that number to an average 40 leads per month next year. If you converted 25% of those leads, try to convert 30% next year. Small wins lead to big results. 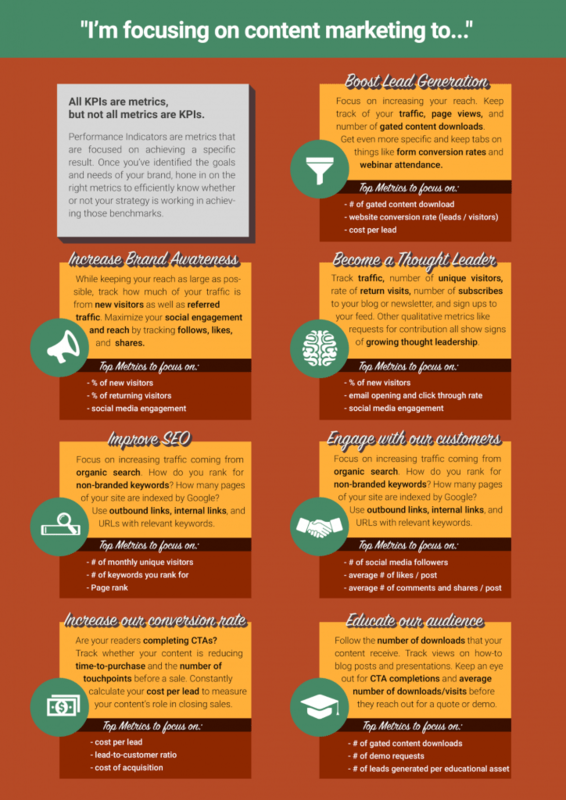 Always reverse engineer your content marketing goals. If your overall traffic is low … then make it your goal to rank on page one of Google in the next six months. To do that, follow the straightforward advice in our Beginners Guide to SEO for Real Estate. If your bounce rate is high … it might be that the quality of your content. 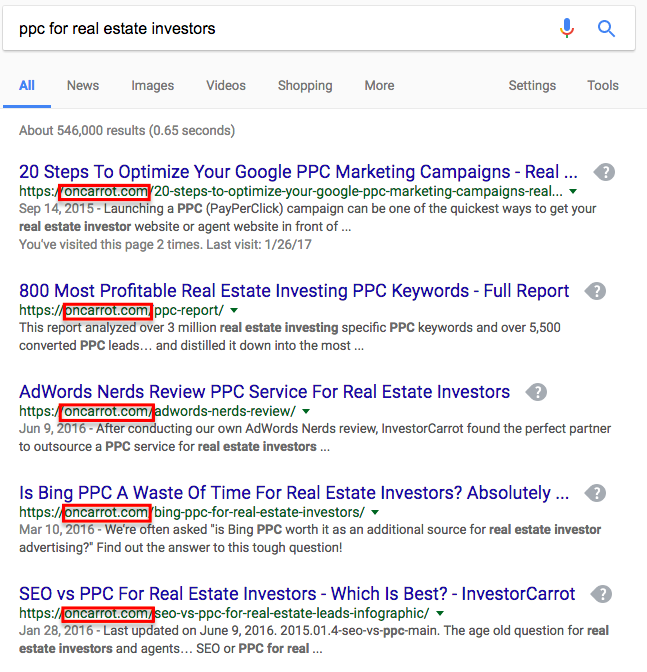 In that case, dig into 30+ Content Marketing Ideas for Real Estate Agents: Inspiration to Bring Your Strategy to Life … Easily. 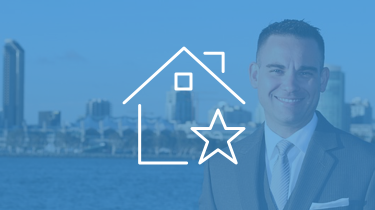 If your onsite conversion rates are low … then you can’t do much better than the Test Report: How Our “Stacked Hero” Page Brought 38.54% More Motivated Seller Leads that walks you through exactly how to build high converting real estate page. Keep an eye on the telltale signs of low-quality content, though: high bounce-rate, lots of unsubscribes, or lack of interaction. Now that you know where you are and where you want to go, here’s one last piece of advice: Hesitation won’t get you anywhere. You want to make a better business and a better life for others, so dream, dream, dream. But, write down your dreams as you do. Think long-term ambitions. And once you have them, turn those dreams into actionable goals by going back through this guide and plugging them in exactly where they’ll do the most good. Dream big. Plan big. And make your real estate content marketing goals — above all — realistic and actionable. Because that’s how you get from where you are … to where you want to go.